The most visited tropical destination in the world and for good reason. Sandy beaches, palm trees, volcanoes, scuba diving, luxury resorts and villas. It’s 11,000 feet from the top of Haleakala crater down to Maui’s whale-filled seas and you can experience them both in the same day on this compact island. 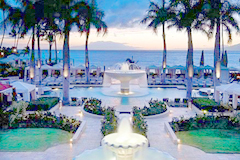 Whether you’re drawn to shopping, nightlife, art galleries, beaches, golf or spas, Maui will charm you. 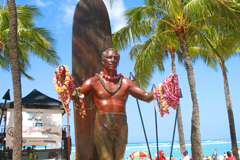 The island that attracts the most visitors to Hawaii, Oahu is home to world-famous Waikiki Beach. 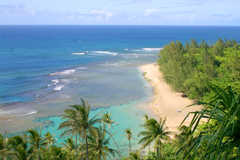 From Diamond Head crater to Pearl Harbor, Iolani Palace to the Banzai Pipeline, Oahu offers unique attractions plus fine restaurants, shopping, golf courses, and nightlife. While the Big Island challenges athletes in the annual Ironman Triathlon, vacationers are energized by its golf-shopping-dining triad. No trip is complete without a visit to Hawaii Volcanoes National Park. Hike to the lip of Kilauea’s red-hot caldera, especially dramatic after dark. Lush Kauai offers vibrant beauty. For the big-picture view of lush Waimea canyon, the steep cliffs along Na Pali coast, and Kauai’s uninhabited beaches, take a narrated seaplane excursion. On land, relax at the lush Princeville and sunny Poipu Beach resort areas. 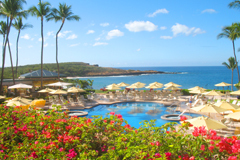 Once the site of the world’s largest pineapple plantation, small & isolated Lanai has no stoplights, one tiny town, and two five-star resorts. 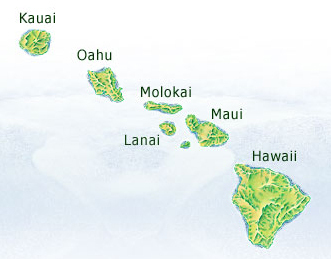 This island of Hawaii is a favorite with snorkelers, especially Hulopo’e Bay. 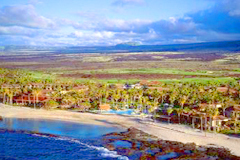 Golf, sun, swim, hike, and saddle up to ride across Lanai’s sun-drenched terrain.